When Kei Ito was born, his grandfather asked the doctor to confirm that his grandson had all ten fingers and toes. Ito’s grandfather needed closure. He needed to know that his grandson was free of any mutations caused by exposure to radioactivity. “My grandfather knew I would be fine, but, you know – he had to ask,” Ito recalls. Ito’s hands flex and he stretches his palms away from the cup of tea he holds, perhaps instinctually to remind himself of the fingers he was indeed born with, perhaps the habitual itch of a photographer’s hands. He pushes his teacup aside, physically making room for what he wants to say next. It’s mid-afternoon on a Thursday at BAMF Café in Baltimore’s Station North Arts & Entertainment District, and Ito and Keiper are huddled in a wooden booth, giving me a personal history lesson of the U.S.’s engineering and detonation of the atomic bomb over Hiroshima. The lesson is rich with insights that come from their intertwined family histories with the bomb. They pause occasionally (and patiently) to indulge my hurried fact-checking searches between note-taking, and most times procure an original article or family photo that trumps any social-fed, Wikipedia page ‘the Google’ turns up for me. “So, do you?” Keiper, asks Ito. “Do I what?” Ito says. “Yup!” Ito responds, holding out his digits, which Keiper promptly counts for confirmation. The two laugh in a rare moment of levity. When discussing nuclear Armageddon, you have to take the humor where you can get it. This deep dive into the history of weaponized nuclear power, while oh-so relevant in our current news cycle, has to do with something more auspicious – the latest of Ito and Keiper’s artistic collaborations together, Afterimage Requiem. In 2016, Ito and Keiper received a Rubys Artist Project Grant through the Greater Baltimore Cultural Alliance to create Afterimage Requiem. The exhibition is a large-scale visual and sound installation that probes the atomic bombing of Hiroshima, and provides a palpable means to contemplate the roots, sorrow and scope of what has become a distressing reality of our human existence – the threat of nuclear war. It runs January 19-31, 2018 at the Baltimore War Memorial. Keiper is a sound artist, and Kei is a photographer. Both have experience in installation art, both live in Baltimore, both received an MFA from MICA’s Photographic and Electronic Media program in 2016. Both have a familial tie to the atomic bomb, which creates profound situational irony, and, well, makes for an interesting story. The story of how they met begins with a basic necessity that is perhaps the bane of every budding, broke student-artist’s existence – how to find cheap housing. The two found each other on MICA’s online housing board while searching for housemates to share an apartment with in Baltimore City during their years in graduate school. They exchanged a few emails to coordinate logistics in the weeks leading up to the start of graduate school, and met in-person the night before orientation. Keiper’s grandfather, Lovell Cardenas, contributed to the development of the atomic bomb as an engineer on the Manhattan Project, a research and development undertaking during WWII that produced the first nuclear weapons. Keiper disclosed this information to Ito, sitting on the couch of the new home they were to share for the next two years. 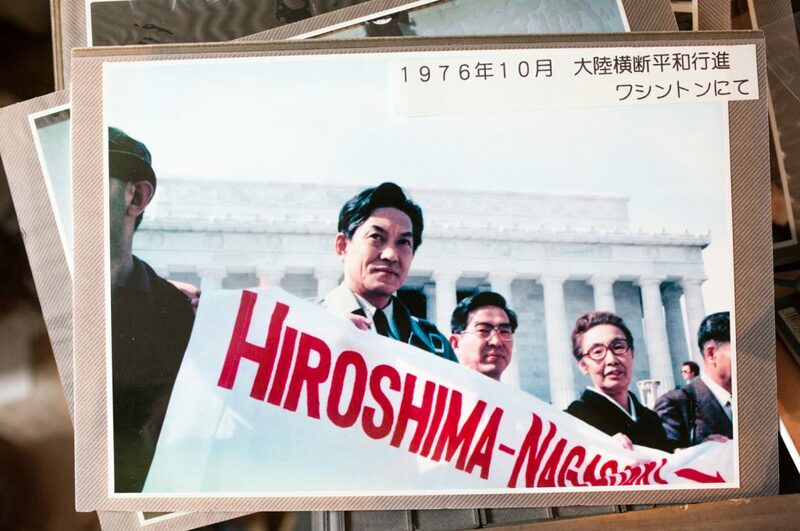 “We made a promise, just weeks into knowing one another, to one day collaborate, and create something about this connection to the atomic bomb,” Ito said. Much of the imagery that was presented to the American public in the immediate aftermath of the Hiroshima and Nagasaki bombing was of power and might – the now infamous mushroom cloud swelling, then curling upward and into itself, ballooning with smoke, debris and condensed water vapor. The common American was hard-pressed to find any major news outlets depicting corpses or maimed survivors of the bombings. In early 1946, several months after the bombing of Hiroshima, the U.S. Strategic Bombing Survey used a film crew to document the results. According to an article published by the Huffington Post in 2009 titled “The Great Hiroshima Cover-Up,” the total of 90,000 ft. of film shot by the cameramen from this effort had not been fully aired as of 2009. Art became an anecdote for what was quickly becoming global amnesia about the single greatest turning point in modern history. Nuclear art emerged, perhaps most deliberately through survivor artwork that was collected in 1974 by the Japan Broadcasting Corporation, and remains on display at Hiroshima Peace Memorial Museum. Dali was inspired by the a-bomb, Pollack tried to compete with it, and most recently, Gregory Green is an artist who constructs nuclear bombs in order to explore humanity’s potential for real chaos. Ito and Keiper believe that Afterimage Requiem pivots from the standard ultimatum that requires us to view our nuclear past and precarious future as either all-powerful or hopeless. Instead, they describe the installation as vacillating between the extremities of power and darkness on the one end, and regeneration and light on the other; creating agitation, dynamism, and offering audiences a boundless journey through grief, remembrance, and eventually, hope. Their collaboration, most recently made manifest, is roughly two years in the making. Their work together and apart has been marked by fits and starts, lots of individual experimentation, and circuitous meanderings through subject matters that keep them coming back to the a-bomb within their respective mediums. Ito used his two years in graduate school, to develop his style of camera-less images, and to enhance the conceptual strength of his work by freeing himself to focus on issues that impacted him personally. “That is how I came to terms with the fact that I needed to make peace with Hiroshima,” Ito said. “It was a very personal subject that I shied away from because I was not sure as a photographer and an installation artist, how to retrieve something that is gone, taken away, or destroyed. How do I materialize the fear of radiation and the memory of one I loved? The idea of visualizing the invisible is something I have been continuously exploring in my practice as an artist,” Ito said. He designed a ritualistic image-making process that has been honed through his ongoing works Sungazing: Prints and Sungazing Scroll, allowing himself and others to grapple with the legacy of mass destruction and power. In order to express the connection between the sun and his family history, Ito created 108 letter-size prints and a 200-foot-long scroll, made by exposing Type-C photographic paper to sunlight. The pattern on the scroll corresponds to his breath. In a darkened room, he pulls the paper in front of a small aperture to expose it to the sun while inhaling, and pauses when exhaling. He repeats this action until he has breathed 108 times. One hundred eight is a number with ritual significance in Japanese Buddhism and culture. The results of Ito’s rhythmic and symbolic process are arresting. 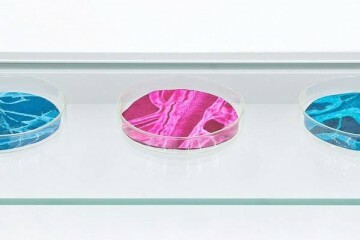 The chromogenic color prints evoke the powers of duality, presenting organic and free-form black shadows, which envisage Ito’s breath, against an intense color burn of inorganic atomic reds, oranges and yellows. Without context, a viewer could quite possibly interpret the prints as photographic executions of the womb. Or, an atomic blast. “If the black parts of the print remind you of a shadow, it is the shadow of my breath, which is itself a registration of my life, a life I share with and owe to my grandfather. The mark of the atomic blast upon his life and upon his breath was passed on to me, and you can see it as the shadow of this print,” Ito said. 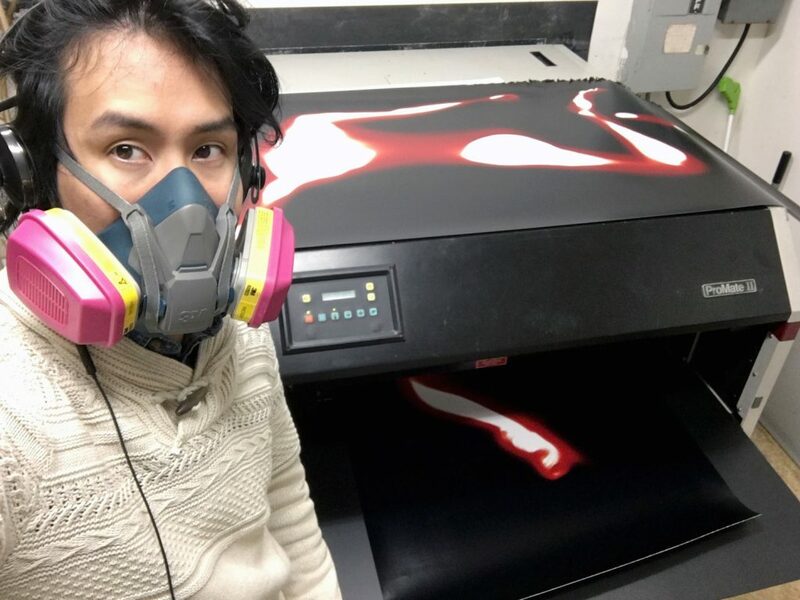 As Ito found his artistic stride between 2014-2015, Keiper found himself immersed in collaborative graduate work as a means to offset something of a creative impasse in his solo practice. Keiper came into graduate school with an art background that spanned the gamut from painting and woodworking to video and performance. But he had a growing interest in sound-based art and experimental music. During the 2015 Baltimore Uprising, following the death of Freddie Grey, Keiper participated in protests and says he was moved by the response of the people in Baltimore. “It seemed to me that it was necessary to make work about this,” Keiper said. And he did. He began producing political work that focused on white supremacy and police brutality. He collaborated with poet Fire Angelou to create Listening Is a Political Act, based upon her poem Earthquake. He developed Rough Ride, an 8-channel sound-based work that weaves together sounds from the Baltimore Uprising and audio culled from social and mass media, along with the sounds of police surveillance, control, and violence. As Keiper moved into the second semester of his first year, however, he felt that if he continued this work, he would overstep his boundaries as a Caucasian man, preferring to foreground people of color’s voices. 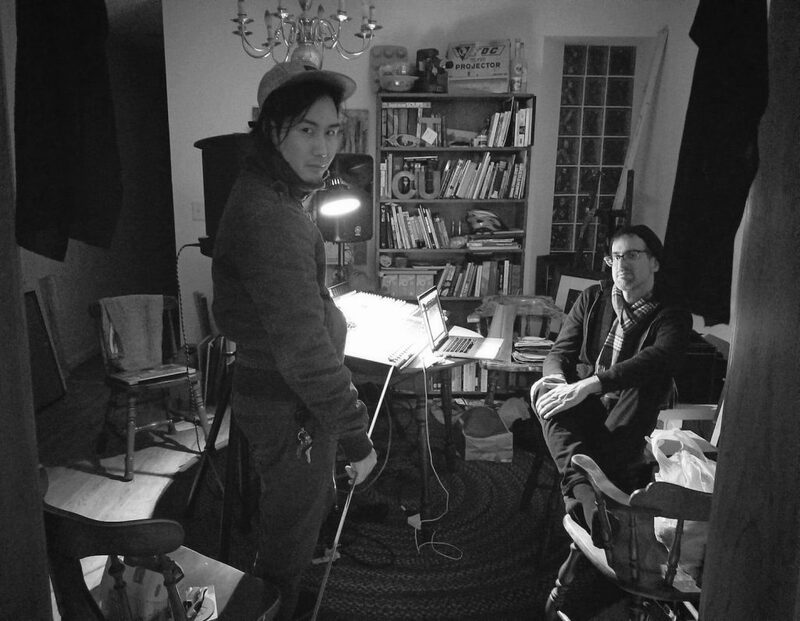 Keiper collaborated with painter Morgan Everhart on her thesis, Drive developing sounds for a large painted diptych with a two-channel sound piece, and he began researching and developing sounds for that eventual collaboration he and Kei promised to do one day. By the time their second, and final year in graduate school rolled around, the two began to lay the groundwork for a collaborative installation concept. They worked together to submit their concept to the Ruby Artist Project Grant, and were one of only nine selected for the Literary and Visual Arts Grant Program in 2016. “It quickly went from ‘This would be a cool idea,’ to ‘We have to figure out how we’re going to pull this off!’” Keiper said, laughing. He glanced at his phone, quickly checking the date, and Ito instinctually did the same. “Oh my gosh, the installation goes up next week!” Ito says. The Afterimage Requiem exhibition includes 108 human-scale photograms that were made using using sunlight, light sensitive paper and Ito’s body evoking those lost in the bombing; and a 4-channel sound work by Keiper that portrays the places and processes of the bomb’s production, and includes field recordings made at atomic heritage sites in New Mexico and Chicago. 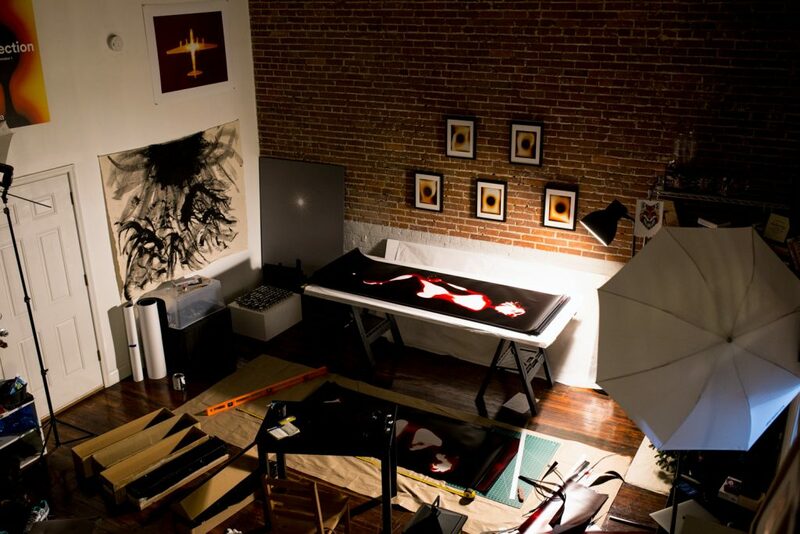 Ito used his trademark cadenced process of breathing and sunlight exposure to create part of the Afterimage Requiem photograms during the artists’ trip to Los Alamos, N.M in June 2017. Though there were 19 different project sites, the first nuclear device ever detonated was an implosion-type bomb during the now-famous Trinity test, conducted at Los Alamos. 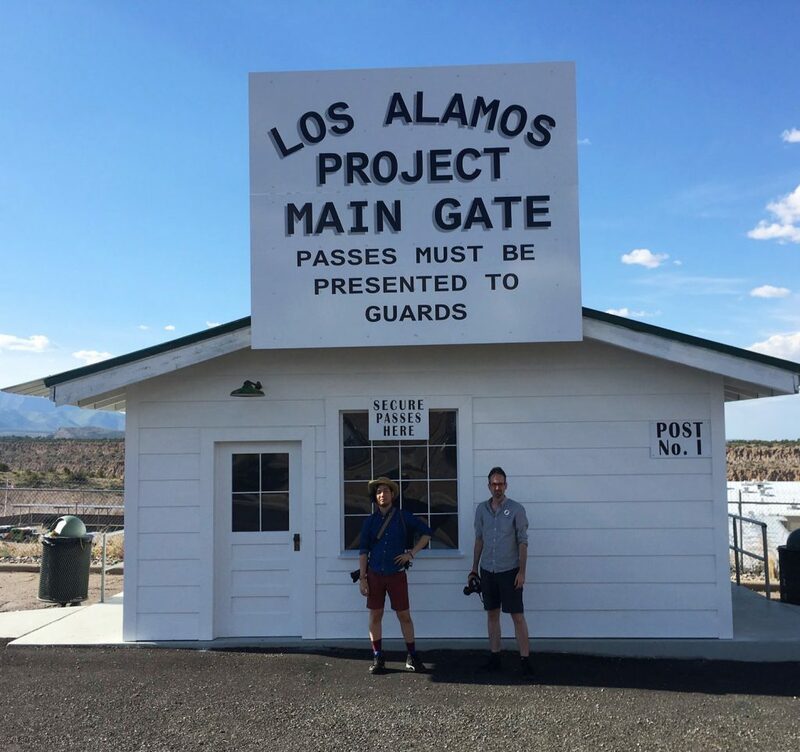 The trip to Los Alamos was a critical part of their proposal, but posed a few challenges that in the end contributed to the ethos of their work. For instance, there were the Ford F-150s. Two days after my interview with Ito and Keiper, on Saturday, Jan. 13, 2018, Hawaii was thrown into a state of momentary panic as push alerts pinged local’s phones in error, warning of an inbound missile threat. A handful of the 394 sirens on the island went off, many legacy of the Cold War era, creating an eerie visual and audible composite of people and noise set against a paradise-like setting that was at once nostalgic and tragic. There is a certain memory lapse that happens between generations, leaving humanity prone, if not indeed doomed, to repeat our past. Seventy years after the dawn of the Cold War, the threat of the Atomic Age is greater than ever. Nine countries have stockpiles of nuclear weapons thousands deep and more powerful than the atom bomb that hit Hiroshima in 1945. Yet, in an uncanny similarity to the censorship and public response of the mid-20th century, the pangs of nuclear warfare go unfelt—a disquieting state that art, like Afterimage Requiem, has the power to change. In the age of Big Data and infinite information, the artist can play a critical role in curating not just knowledge, but memories of the past that we have either forgotten or do not hold first-hand. “We need to remember our mortality,” Ito said. “For me, this is an exceedingly disturbing historical time to become as intimately familiar with nuclear weapons as I have become,” Keiper adds. Afterimage Requiem is “more than just hope.” It is a visual and audible dialogue that while presented in abstract form, has concrete application to our fragile existence. The images and sounds shake the apathy from our bones, leaving us not just hopeful, but demanding of a better, more humane future. I end my interview with Ito and Keiper suddenly more conscious of my otherwise trite farewell. “Hope to see you soon,” I say. More info available at the Afterimage Requiem website. Nicole Clark is a Baltimore-based writer, strategic designer, and artist. She is a Jane of All Trades, and boasts myriad skills such as toasting bread, convincing her friends to move to Baltimore, and is fluent in consultant-speak. When she’s not consulting or writing, she can be found throwing paint in her basement. Follow her on Medium @nicoleclark_82135, IG @nikiclark83, or at nclarkcreativesolutions.com.